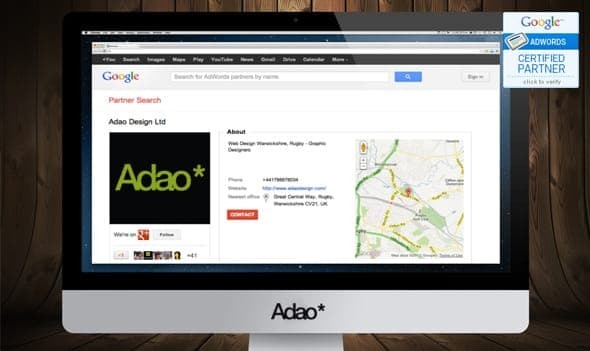 We are pleased to officially announce that Adao Design* are now an Official Google Adwords Partner. It means that Adao* are a trusted company that you can depend on to get the best out of your Adwords PPC (pay-per-click) campaign. Whether you want to set up a completely new Adwords campaign, or you want us to take over your existing campaign and optimise it to get the best out of it, Adao* have the skills to ensure your Adwords campaign is running the best possible. By using an Official Adwords Qualified Partner like Adao*, you can be sure that it is the best way to ensure maximum ROI for your hard-earned money. It also means that the individuals who would be working along with you and your Adwords campaign are all qualified with Google. Google required two team members from Adao* to take and pass 2 challenging Adwords certification exams. In our case, both David Ohandjanian (Managing Director of Adao*), and Joshua Clare-Flagg (Internet Marketing Specialist) have completed this. The first is a fundamentals exam, which covers every single aspect of Adwords advertising in one exam. This is to ensure the candidate has a good general knowledge of the system. Next, David and Josh had to take a specialist exam. Both completed and passed the Search Advertising Advanced Exam. This covers the advanced best practices for managing Adwords campaigns. The exams are in-depth and cover every aspect of the Google system and best practices, with around 100 questions, lasting for 2 hours and requiring a score of 85% to pass. Another requirement is that Adao* has a decent good portfolio managing at least $10,000 worth of Advertising spending in 3 months. With an impressive international Adwords client base, you can be guaranteed that Adao* will look after you marketing spend well! Our ideal location means that we are the best option for any looking for PPC in the Midlands. And of course, here is the certified icon provided by Google to prove our status.